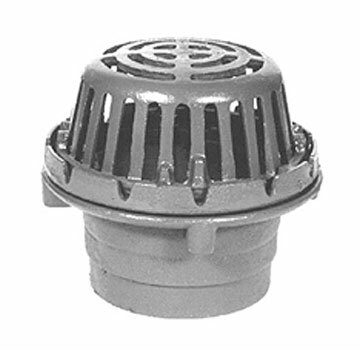 PRODUCT: Zurn Z125 8-3/8 inch Diameter Roof Drain, Dura-Coated Cast Iron Body with 4-1/4 inch High Low-Silhouette Poly Dome and Combination Membrane Flashing Clamp/Gravel Guard, 3 inch Pipe Size outlet. Price/Each. Outlets: Available in 2, 3, 4" outlets, and IC Inside Caulk, IP Threded or NH No-Hub.